This addon is no longer in active development! If you would like to contribute and become a maintainer let me know via PM. Imhothar's Bags is there to ease the management of your items accross multiple characters and adds some little "extras" to your UI. Due to current API limitations it does not do what it was originally intended for (namely replacing the default inventory windows) but rest assured that is to be added as soon as the Addon API allows it. Until then you get the advantage of having all your items displayed in one window, so you get a nice overview of your belongings. You can look at the contents of your bank even while out in the wilderness, and inspect the items of your offline characters. Display all backpack, bank, currency, equipped and wardrobe items each in a separate large window. View all your and your offline characters' items from anywhere you are. View the items of all guilds any of your characters is a member of. Items can grouped by category, bags or not at all ("all-in-one"). Items can be sorted by name, icon, rarity or by slot. Empty slots are not displayed to save space. Instead the number in the top-right shows the number of empty slots. Access the inventory of all your characters on the shard anytime. You need to log into each character in order for their data to become available. Tracks all accounts. Condense multiple full stacks of the same item into one button for saving screen space. The windows can be moved anywhere you wish and resized. Adds a summary to item tooltips showing you whether any of your characters already own the displayed item. 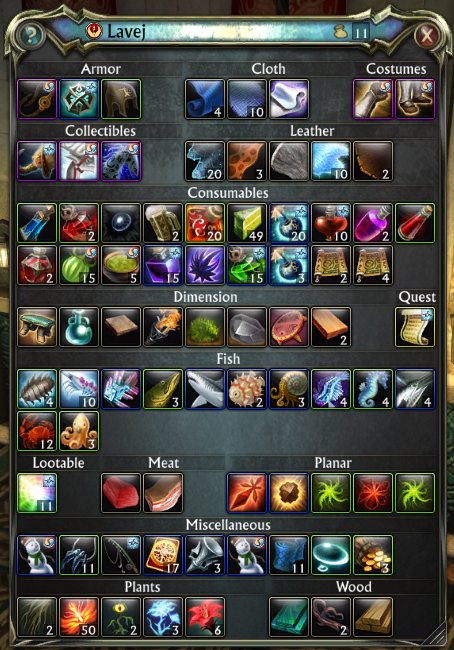 Displays the number of empty slots on the bags bar making it easier to know when visiting a merchant becomes necessary. Search the entire item database to find out whether your characters already own a specific item. Open a little menu at your cursor from where you can open all the item windows of all your characters. This works great if put into a macro. If you wish to help in translating ImhoBags into your language, please let me know! Just drop me a PM. There is a public API which can be used by other addons and might get extended in the future as required. Details about it can be found on the Public API page. The current Rift API imposes some limitations on what the Addon can do. Thus the followig features are unfortunately not possible at this time. But the code is largely prepared to support them as soon as the API becomes available! The ImhoBags windows cannot hide the default Trion windows. The highlights for newly acquired items are missing. The tooltip location, size, etc. is known bug with the addon API. There is nothing we can do to fix it at this time. The complete list can now be viewed in-game in the Config Window. when i mouseover an item in the bag, the tooltip of the item appear at the top-left corner of the screen instead of bottom-right of my mouse. please let me know your progress on this issue here. In localization, it seems ["crafting material hide"] has been changed to ["crafting material butcher"]. I changed it and now is separating out leathers from crafting. Crashes when adding a purchasing trade skill on PTS 2.3. Sets the current texture used for this element. source:	The source of the resource. "Rift" will take the resource from Rift's internal data. Anything else will take the resource from the addon with that identifier. texture:	The actual texture identifier. Either a resource identifier or a filename. Well, thank you. I know how to read a stack trace. I know where the error happens since the first error report, and as you can see I already added code to distinguish between code paths. The problem is, however, that the actual error condition originates in some completely different place. I don't know enough of the rift API to tell what is wrong and causing this to fail in the 'else' clause of the second 'if' statement. The only thing I can imagine is that something is borked with the local variable 'set' when it is initialized after the first 'if' statement. Type /imhobags for slash commands. opens the inventory window for the given character. Not sure what to think about the windowing thing. The addon is simply not designed that way. Can you have the Quest or Backpack Overview or OneBag view open with a macro? If so can it always open the window in the same place without having to use the mouse to select from the menu buttons you have open at the mouse tip. I would like the above as well as a single window with the buttons visible to simply change my view between them. Make is a special key to spawn a second window. This is a fantastic inventory organizer and I thank you for your hard work. Still getting an error when opening a guild bank. Hi, if you downloaded the file here from Curseforge I advise not to chose the Alpha (A) packages. Those are development snapshots, work in progress, and most of the time are not working. Them not showing up in the addons list is due to a dependency on a library which is not released yet. I can not use anything past the initial 0.13 beta, for some reason it does not even show up in my addons directory. Sorry if there is some obvious reason its not working but just thought I would let you know. how do i delete a character off the list that i deleted from the game? Sorry, I don't understand your question. What button do you mean? The Addon cannot show your normal bag windows nor can it disable the default bag windows. That is currently not possible. I made a macro for when to open my bag. It works just fine, but it doesnt show my inventory to begin with. I have to click on a button afterwards to make it show, anyway I can do so it instantly shows me all in my bags? I tried that now, but when I use that command something weird happens. And it says: No data available for character ''crunx'' (or it is member of the enemy faction).